Last week I attended a workshop by Kate Briggs, a writer and artist who is currently undertaking a project as part of Leeds College of Art and Design’s “Library Interventions”. Kate’s current work is concerned with how we read books, with a particular (although not exclusive) interest in how individuals engage with novels. When we are not reading a book – when we’ve finished it, or when we have yet to pick it up – what is our relationship to it? Is it possible to hold something the length of a novel in mind, so as to truly know it? What aspects and influences from our own lives impact upon on how we read? 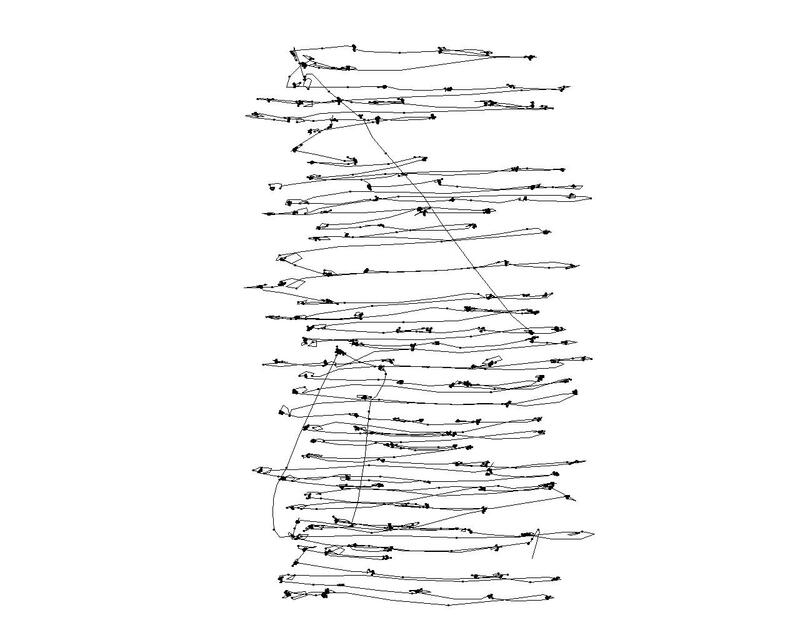 Kate Briggs’ artwork, tracking her eye movements whilst reading “The story in it” by Henry James. These questions are to do with memory and emotional impact, but also relate to the idea of expertise. Kate wondered what it means to be an ‘expert’ on a literary form that is so difficult to retain in its entirety. She showed us 3 examples of her work that track her reading in different ways, variously recording acts of reading in terms of reading patterns or the emotional impact of books. She described these works as ‘methodologies;’ they could be repeated with other books or potentially by other people. Her first example involved noting the time and duration of her reading sessions. This included regular short reading sessions and longer periods over lunch time, about which she explained that she often read whilst her child was napping. This ‘extra’ information is not included in the transcription, but her personal anecdote perhaps demonstrates an interest not just in recording the act of reading, but in the lived context and emotive markers that surround it. The work is from a particular period in her life, indicating the routine that came along with it. For another piece she worked with an experimental psychologist to track her eye movements whilst reading a short story by Henry James. Again her anecdotal explanation was interesting, that she met the psychologist for the first time when undertaking the reading and was initially self-conscious, constrained by the odd situation of sitting in a room, reading in silence with a stranger. The psychologist said that he could tell that the movements got more relaxed as she read, as if she was over-concentrating at first and then as she got more involved in the story, forgot her real world situation. ‘An exercise in pathetic criticism’ by Kate Briggs. The final work she talked about – ‘An exercise in pathetic criticism’ – was inspired by Roland Barthe’s advocacy of a ‘pathetic criticism,’ criticism based on the moments of novels that affect us emotionally, that hold pathos. The work involved her talking to a range of people about their experience of reading the “Count of Monte Cristo,” and the bits that were impactful for them. She was surprised at the small volume of material that people described back to her, although the project also made her reflect on reading as a shared experience – knowledge of the same book meaning you can both inhabit the same imaginary space. I haven’t read “The Preparation of the Novel” – Barthes’ text from which the idea of pathetic criticism is taken – but I have read “Camera Lucida.” It sounds like there is some similarity between the idea of the ‘punctum’ that Barthes advances there and the notion of pathetic criticism. Both are examples of Barthes’ focus on the reception of texts – the ‘birth of the reader’ – but rather than relying on focused, critical ‘reading’ of texts and images, they are concerned with the emotional impact of such representations. The session made me think about the different ways that I read, on the kinds of attention that I give to books, whether for enjoyment or knowledge. For me reading novels is largely for enjoyment and I don’t think too hard about their structure, or attempt either to remember or critique them. As part of a book group I have realised how little I retain of books unless prompted by others’ recollections. It is perhaps the mood, or tenor of a book that stays with me, rather than its specifics. But are books qualitatively different from other experiences in how we remember them? Is it easier to retain an image-based artwork for example? At the start of the session Kate read a quote from Percy Lubbock on ‘The Craft of Fiction’; he made a distinction between books and sculpture or architecture. The latter he suggests are things that exist all at once (akin to the time/space distinction made by Lessing in relation to poetry/painting). But the whole group agreed that this distinction doesn’t really hold. We may also look at a sculpture or a building and retain just a sense of it, not the finer detail. First of all it depends on the initial attention you give to something when you perceive it and then to whether that perception is retained in memory. I’ll be interested to see the outcome of Kate’s project. Because she is undertaking this in an art library she was beginning to think about whether we engage with art books differently from novels. There are potential differences perhaps, including books you use for reference vs. books for enjoyment, books you dip in to vs. ones you read from start to finish, books that are creative objects vs. books that document creative objects, books where images are an aid reading text, books where text is an aid to reading images, or books where text and images help to interpret one another equally.